Pick your poison! Perfect for any Halloween or party event! Winos have the flask. Nerds have the lab flask. 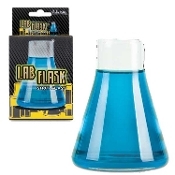 And thanks to the Lab Flask Shot Glass, you can get a buzz going with either! The miniature-drinking vessel, which is shaped just like one of those beakers you remember from chemistry class, makes for a great way to concoct your favorite chemical beverage or mixed drink. Ghoulishly clever way to serve cocktails for Halloween party guests in your mad scientist laboratory… err, BAR. Better drinking through Science! If there is anything we learned from teen movies, it is that nerds know how to party. So this is perfect whether you are blinded by science or blinded by huge quantities of CH3CH2OH. The Lab Flask Shot Glass also makes the perfect stocking stuffer for the geek on your Christmas list. Release your inner chemist! Poker party or fantasy football league bar drinking game accessory. Halloween Potion Prop also makes ghoulish costume party prizes or bachelor party gifts! Holds 2 ounces of your favorite concoction! NEW in Accoutrements manufacturer packaging. Each realistically shaped crystal clear shot glass is a spooktacular addition to a scary or zombie apocalypse theme costume party, setting an eerily death-defying mood. With its ghoulish dungeon-inspired design, it is the ultimate display for the most refined Halloween table. BREAKABLE GLASS-Not intended for use in play by children. Please note: Regular glass. Although it looks just like a laboratory beaker flask, it is not suitable for heated beverages. Holds 2 fl oz (59ml) of liquid.